There are a thousand ways to tell stories, Gianni Rodari used to tell them through the “phone”. From these Phone stories was created the RODARIKA collection. 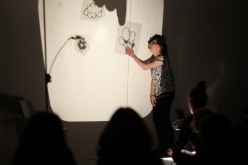 Using an overhead projector, short stories are completed and complemented with images and imagination, in order to present Rodari's characters in our visual world. Guests: ZAKU BETE IPUIN. 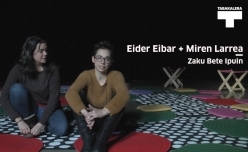 Eider Eibar and Miren Larrea.